The hotel is ideally located in Levallois-Perret in a safe a quiet area in the west part of Paris at 5 minutes walk from the metro Louise Michel (Line 3) which brings you in 25 minutes in Paris City Center. The Hotel Boissière is only at 20 minutes walk from the Champs Elysées Avenue! All rooms are equipped with toilets/bathroom, free wifi, TV channel CANAL+ with LCD screen and hair dryer. All the top floor rooms have a private terrace with a nice view on La Defense district. 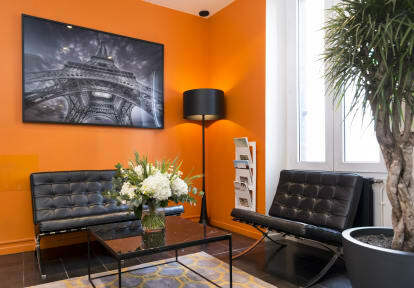 The Reception is open 24 hours a day and the entire team speaks english and will be able to guide you during your stay in Paris. Dear Guest, We are pleased to inform you that we have now in all rooms new TV channels with CANAL+ network and also EUROSPORT. Both channels are in French and English. You can watch in exclusivity all the matches from the Champions League and also all the new movies! Enjoy the movie! Cancellation Policy: You can cancel your stay until 48 hours prior to arrival. Please Note: Credit card details, CVC code and expiry date are required. We will pre-authorise the first night stay after booking. If the card is invalid we will contact you for another card. The hotel reserves the right to cancel a reservation if we do not get authorization on the given credit card. I very much enjoyed my stay and could stay again. Great hostel! Location was great! It's very close to the metro, line 3. It wasn't in Paris city center but very close to it! I would stay here again. Rooms were clean and decent sizes (private ensuite). Not sure about dorms. The staff was also very friendly! Luggage storage was great as we got to spend the early part of the day around Paris before catching our train. I really enjoyed my stay there. Very good value, especially in winter. Quiet area. Very good value hotel with good clean rooms on a pleasant street with lots of useful shops around. A little far out of the centre, so you'll be using the metro all the time. Interesting stay in between going to hostels. It was super easy to find from the station! Just a straight walk. The view from our window was beautiful. During breakfast alot of older people we're staying and wouldn't stop staring at my friend and I. We were not talking and it was very uncomfortable. This is very much not a place with character but a place to sleep while doing your own thing during the day. Would stay again if I went back to Paris. It was clean and had terrible sheets. As someone who was traveling alone, feeling safe was very important to me. I felt very comfortable in the hotel and the surrounding area. The Louise Michel Metro is a few minutes' walk away. Honestly, everything was great, except I couldn't reliably connect to the WiFi in my room. I figured it wasn't a problem, as long as I could go down to the lobby if I really needed to use WiFi, but my phone couldn't even detect the network anywhere in the lobby. TL;DR Great value, clean, safe, but no WiFi. A nice room with a window to the street outside the hotel. Comfortable bed and bathroom. Good wifi. Quiet neighbourhood and not far from a Metro station. Great value for money, very clean rooms and good location. The staff was nice as well. The only thing is that the bedrooms aren't sound proof at all, so you can hear everything outside.